Pontefract Castle01977 723440work CastleDiscover a place where kings were feted, and killed. Explore the remnants of ferocious sieges, and Victorian pleasure grounds. Imagine loyal Royalist soldiers, and enterprising liquorice farmers. Visit Pontefract Castle. Since its construction in 1070 until its destruction nearly six centuries later, this once-fearsome fortress dominated the politics and power balance of the entire Yorkshire region and beyond, earning the nickname, “Key to the North”. So great was its infamy that Shakespeare included Pontefract Castle in two of his plays, Richard II (who was murdered at the castle) and Richard III. During the Civil War, the castle endured three bitter sieges. Eventually, the Royalists were forced to concede defeat. Cromwell ordered the castle demolished, and it fell into disrepair. Afterwards, the site was employed for a variety of unusual uses, including as a Victorian pleasure ground, as well as growing and storing Pontefract’s most famous crop – liquorice! Today, the castle is a place of family-friendly adventure, with wide open spaces to explore and play, and fascinating ruins to investigate. 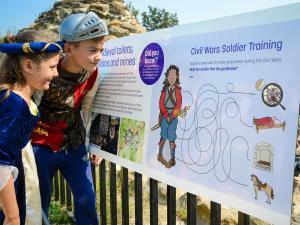 Discover the captivating stories of the castle in the History of Pontefract Castle displays. Be bold, and take a chilling tour of the dungeons – see where prisoners left to languish scratched their names into the rock. Stand in the remains of the bread ovens, and be transported to a time when the castle was equipped for lavish banquets, hosting some of England's most famous monarchs. 2019 is an exciting time to visit! A £3.5 million Heritage Lottery Fund project to preserve the ruins of the castle and improve visitor facilities will be complete in spring this year, opening up parts of the castle not seen for centuries. In addition, the castle is hosting an exciting range of events and activities throughout the year, celebrating the fortress’ rich and diverse history. Parking is available on site and in nearby town centre car parks. Discover a place where kings were feted, and killed. Explore the remnants of ferocious sieges, and Victorian pleasure grounds. Imagine loyal Royalist soldiers, and enterprising liquorice farmers. Visit Pontefract Castle. PLEASE NOTE: While the conservation works continue, some parts of the castle may not be accessible until later in the year, but there’s still plenty of fun to be had!